iFileRecovery is a user-friendly and completely Free file recovery tool, designed to restore accidentally deleted files and directories in local hard disk and removable devices, such as CompactFlash, SmartMedia, SD Card, MemorySticks, USB Flash devices, SanDisk, etc. The software recovers files deleted from Windows Recycle Bin, deleted using Shift + Delete keys bypassing Recycle Bin and files deleted from DOS prompt. Even recovers lost data from formatted disk, virus infection, applications crash, unexpected shutdown, system crash or any other unknown reasons etc. It is powerful software that ability to recover documents, photos, video, music, folders and other file types from NTFS or FAT32 file system. 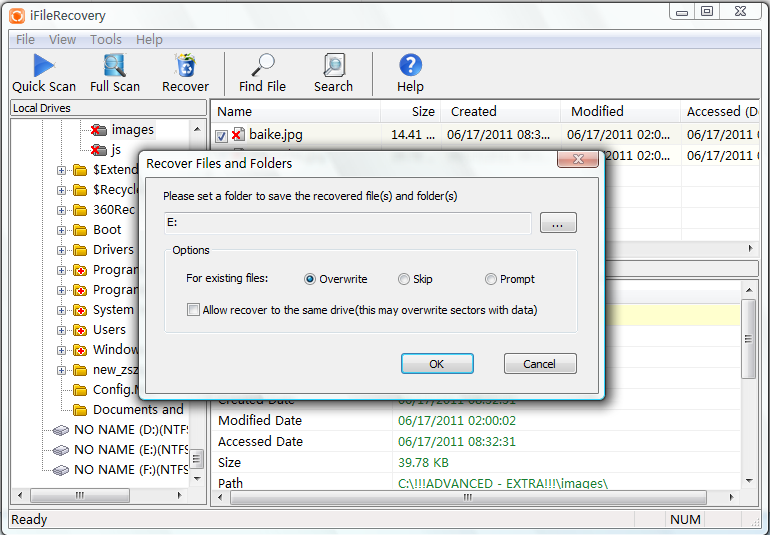 iFileRecovery is completely safe to use since it does not attempt any risky repairs to the drive it is scanning. If you have lost data from your hard drive or deleted by mistake, iFileRecovery can quickly and effectively restore your files with just a few clicks. no matter what type of file you have! Stellar File Wipe Windows Software to delete redundant files from the system as well as it optimizes the system performance. The software wipes data to an extent that the recovery of the data is not at all possible.